So I have my man cave looking pretty good, what with the arcade and all, and I knew that I wanted to have a flat screen mounted on one of the walls downstairs. There was one wall that I had in mind as it was adjacent to a small closet. My end goal for the whole project was to have a clean looking flat screen mounted, with all my current consoles hooked up, as well as my media server. 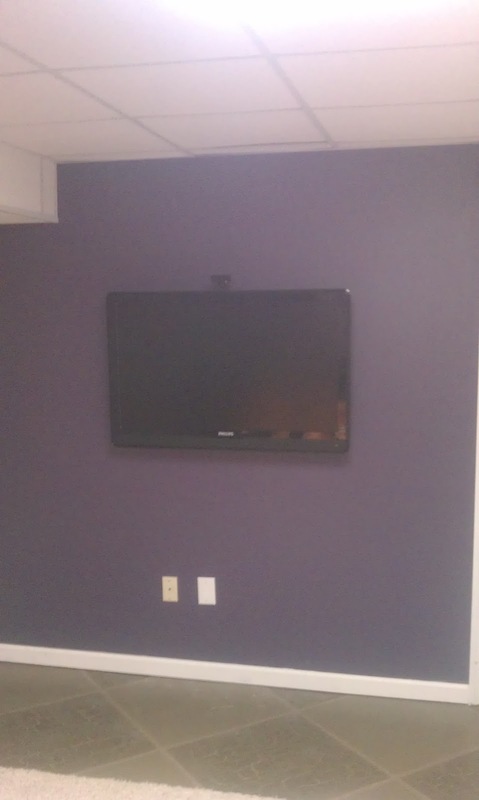 I like the idea of having a TV mounted to the wall with nothing showing around it, but all this great entertainment coming from it. So here is the initial setup of the TV. As you can see I have a drop ceiling in the basement, and also the power and coaxial cable are on the bottom of the wall. 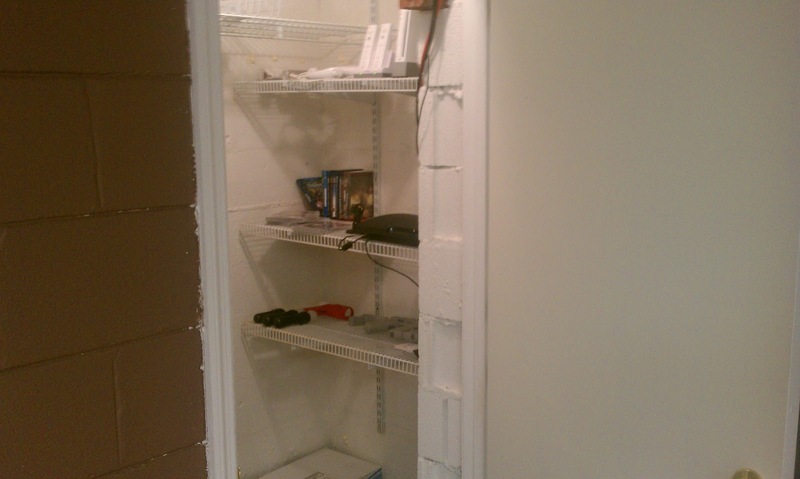 I also have my PS3 HDMI and USB cables, Wii Component cables, and audio cables all coming down from the ceiling. It looks pretty bad. The game console cables run up to the ceiling and then over (to the left) into the closet, or what I am now calling the media closet. 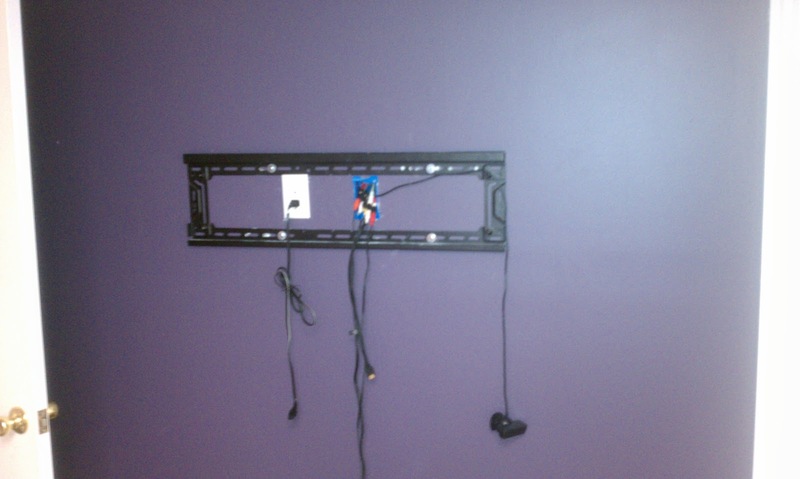 First, I need to move all my media cables behind the wall. Now this is more difficult than normal since this is an outside wall, and it has insulation within it. I had to buy a fish tape to get this completed. 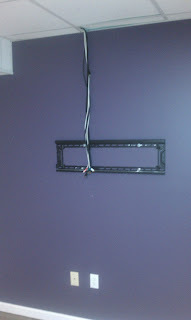 I used some wire coat hangers that I unbent, and then duct taped together. This works pretty good if you just need to guide the cable and you have nothing in your way; but if you have a wall with insulation then you are gonna need something like a fish tape to get the job done. 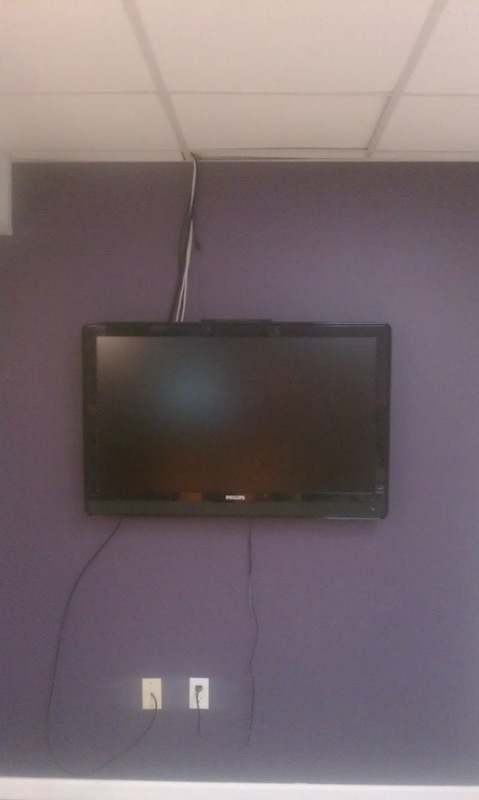 Here I have all the cables behind the wall except my PS3 camera. I use USB extension cables to deal with the length of cable I need. I also extended the Wii component cables with AV connectors and more AV cables. All the AV cables are the same thing, so I used the Red, White, Yellow cables of a composite set connected to the Blue, Red, Green cables of the component...this just got really confusing didn't it? Now all the cables are behind the wall. You can see at the top I cut a hole above the drop down ceiling to start running the cables behind the wall. 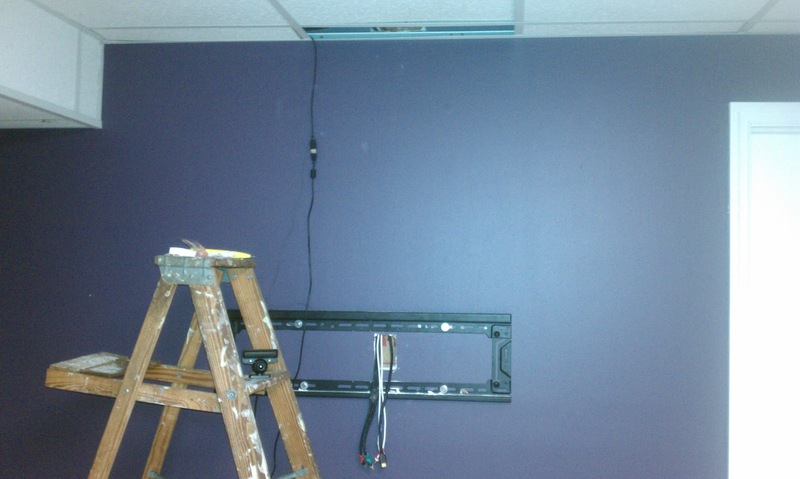 After I moved the ceiling tile back in place I then needed to move the power plug behind the TV. First, I shut off the breaker to the plug and then went about daisy chaining the electrical cables and sending them 5 feet up the wall. 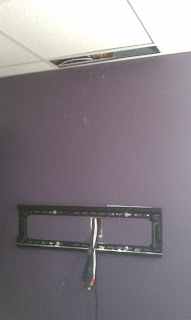 I cut a hole at the TV mount and re installed the power outlet. It really didn't take too much time, all I needed was about 5 feet of electrical cable, and an electric box. I also bought a face plate to cover the bottom hole that was left where the electrical outlet used to be. Here is a final shot of the setup without the TV mounted...it looks like my wall is throwing up cables...kinda badass actually. 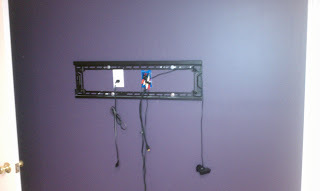 Now I have the TV mounted but my motion controlled games are not able to be played in the current setup. The issue is two fold. 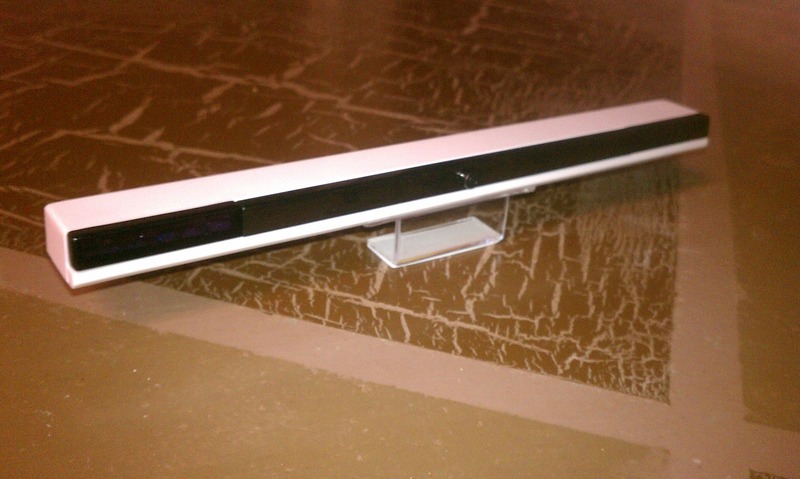 First, the Wii needs a light source for the motion controller to work. Since the length I needed to go was too long for the standard Wii sensor bar that comes with the console, I had to buy a wireless one. I found one on eBay for pretty cheap, around $5. Second, the PS3 camera has a big issue with staying still. 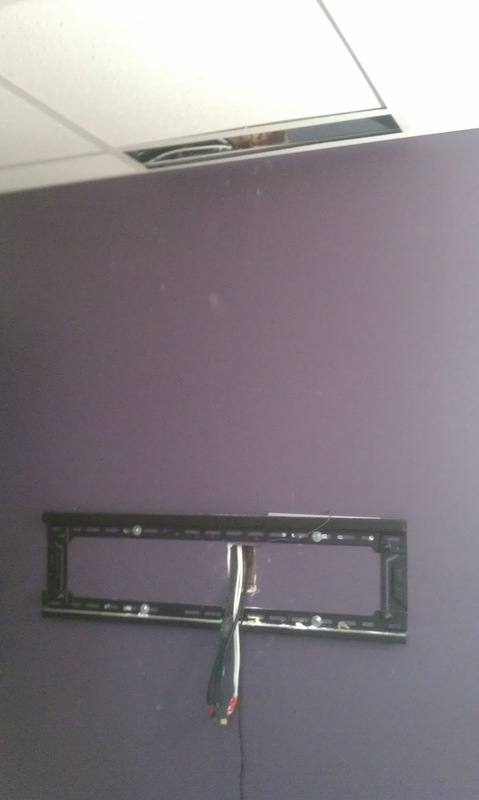 I can currently set it on top of the TV, but I cannot get it to stay in the position I want since the cable coming out the back end really dictates which was it will face. 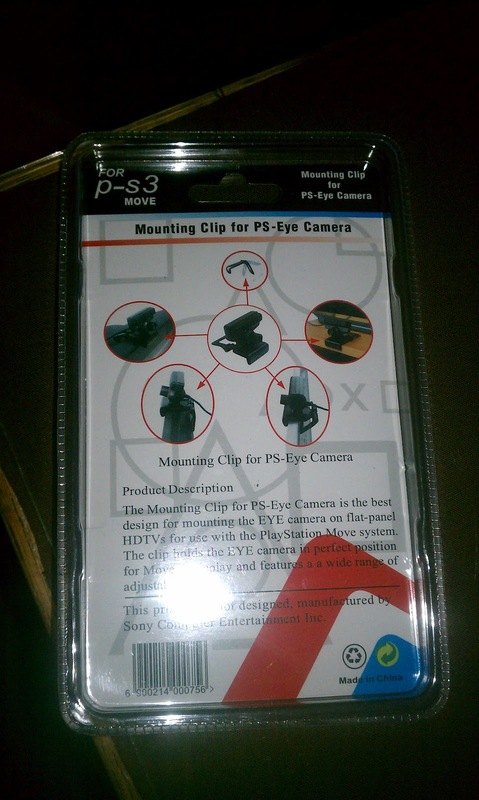 Whether Sony did this on purpose to sell more clips, I have no idea, but as you know I am very cheap frugal. 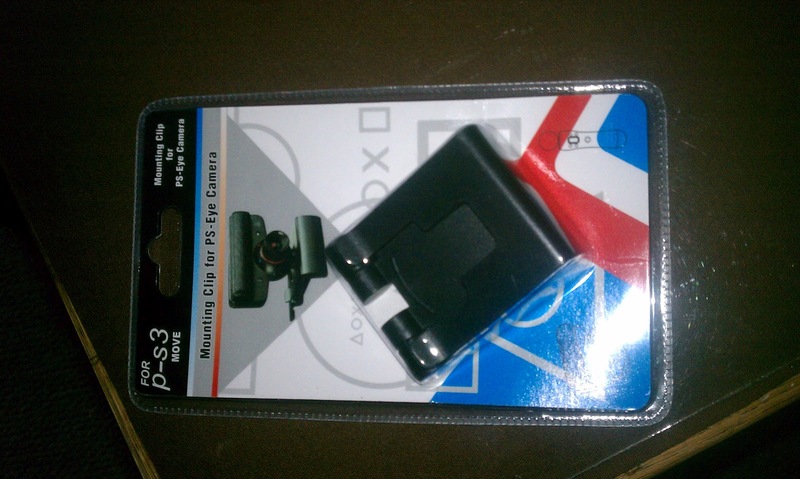 So I looked around online for a cheap Sony PS3 clip, and found one for $1 on amazon with FREE SHIPPING. I kid you not, I quickly ordered without looking at the length of time it would take to get here. Afterwards, I found out it was going to take around 5 weeks because it came from China. Yeah...The P-S3 camera clip. Now this is a problem because I do not own a P-S3, but I thought I would give it a try anyway...and it worked! 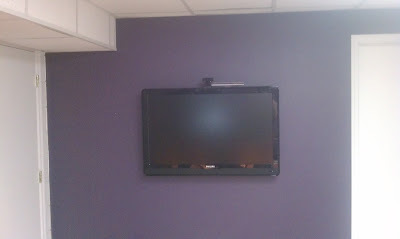 Now, with the camera clip I am done with the TV setup. Here is the finished product looking nice and slick on my purple wall...I am looking into painting that sometime in the future. On the left you can see the media closet door. This is where I have the PS3 and Wii stored, and I am planning on moving the Media Server down there and streaming all my media through out the house via the home network. 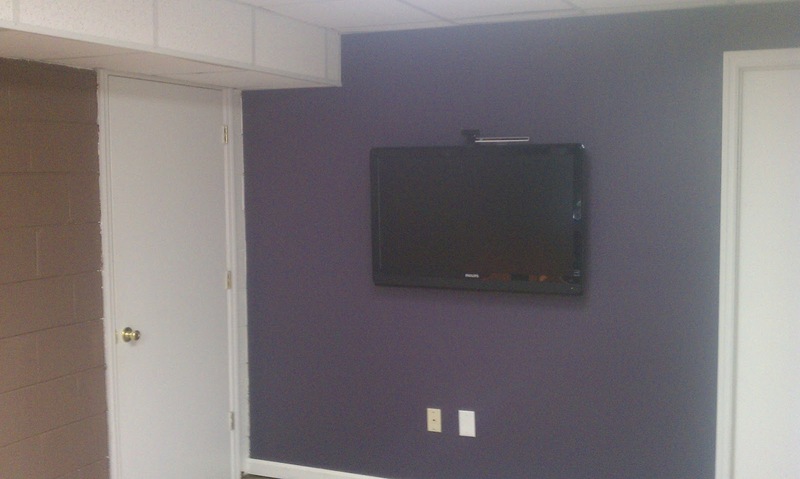 Here is a shot of the inside of the media closet. I have the Wii up top, and the PS3 with some blu rays and loose games on the mid shelf, my move equipment is on the bottom. I really like having all this in a easy to access area, but also having the overall game area being clean. It helps too for motion controlled games to have a lot of space to work with so you don't accidentally smack something with your arm...Having said that I am signing off to go play some Kung-Fu Live! Until next time.